Discover how to increase your sales intelligence before meeting with corporate decision makers by using a simple acronym. Six months after attending a Tony Robbins seminar in 1994, renowned sales consultant Dave Stein owned a single engine Cessna and also earned his instrument rating - something he'd always wanted to do, but hadn't. Tony's motivational messages tend to have that effect on people. But there was another tactic Tony shared that day that Dave has used many times since: BEND-WIMP. If you have an important meeting with a decision maker looming on the horizon, give BEND-WIMP a try. Before meeting with executive decision makers, it’s critical to have a deep understanding of who they are and what they think. BEND-WIMP is a checklist that – by touching on each point – ensures you are armed with maximum sales intelligence prior to meeting with an important prospect. Luckily today, with tools like LinkedIn Sales Navigator and the expanded profile viewing capabilities within it, gaining sales intelligence is easier than it’s ever been. B – Beliefs. This is what the decision maker believes about you, your company or your product. Knowing this prior to a meeting gives you an idea of what you’re up against, including any misguided thoughts you may need to dispel. Check your CRM records for any notes regarding previous meetings or conversations with the decision maker or anyone else within the decision maker’s organization. And if your CRM is integrated with LinkedIn, you can view the rich profile details directly from your CRM system. E – Evaluate. What is this person’s evaluation process? Is it based on statistics and evidence or by gut instinct? This can help you prepare for any questions the decision maker might ask. 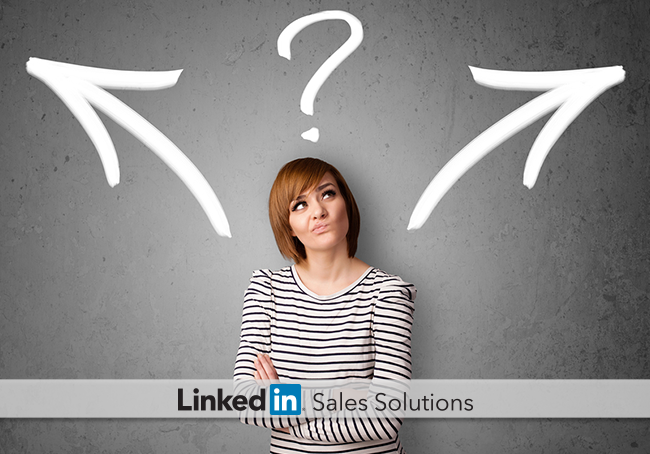 Reading the decision maker’s LinkedIn recommendations can provide insight into the qualities your prospect holds in high regard. Of course you can always ask the gatekeeper or sponsor within the organization, too. N – Needs. What are the pressing business needs? What will allow them to achieve corporate objectives? D – Desire. What do they strive for on a personal level? Searching within social channels can help you identify personal desires. W – Wounds. What mistakes or errors in judgment has the decision maker or company as a whole made in the past? Knowing this can help you avoid touchy subjects. I – Interests. What does your decision maker like to do when away from the office? Again, searching within social channels can help you find common ground. M – Mentors. Whose opinions does the decision maker value most? Does your prospect routinely share content from specific industry influencers on social channels? Dave Stein tells the story about how he once won a customer because he read Who Moved My Cheese? during the flight to a sales call after learning the CEO had all his people read it. P – Proud. What accomplishments is the decision maker most proud of? Knowing this can be a great way to get the prospect to do the talking and maintain an air of positivity during your meeting. You can also use a solution like TeamLink to see how your corporate decision maker is connected to the professional networks of your entire organization. Common connections are a fantastic resource for sales intelligence. Do you have an important meeting with a corporate decision maker on the horizon? Give BEND-WIMP a shot and see how the added sales intelligence improves the effectiveness of your meeting.